Ashley Duarte is moving to Seattle this weekend to begin college! She and her family were one of the first families to purchase a home in Tierra Vida. After 10 years, Tierra Vida has become a flourishing and growing community. Ashley recently graduated from Chiawana High School. Sh. She was born in a family of four siblings. Her parents were hard-working people. She said that she had a normal childhood and grew up sharing a special bond with her father who would regularly take her on fishing trips. She said that was probably the highlight of her childhood. 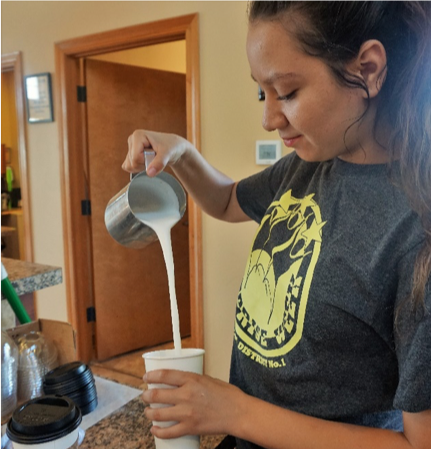 Ashley’s association with the Collegium began with the Barista Work-Readiness program. She was part of the first cycle of students. She instantly took a liking to the job as she learnt how to make drinks, coffee, food and other daily cafe operation procedures. She took on a leadership role and was later brought on to work as a shift lead for the second cycle of students to work alongside them and help them gain job skills. Ashley believes that the Collegium Café is different because of its welcoming ambiance. She stated that she was very shy and a quiet person. However, the job experience as a barista at the Collegium Café changed her life. She stated that working at the Café gave her a sense of belonging because everyone welcomed her and made her feel at home. The experience gave her the opportunity to meet new people, and make new friendships with many meaningful conversations. She disclosed that the Collegium has been instrumental in improving her communication and workforce skills and has made her a confident person. Ashley stated that as a child she has always been very studious and ambitious. She said that Walter Chimal (CASA) has been a guiding force who has constantly encouraged her to be a better and successful person. She admitted to being very excited to begin her pursuit of a course in Psychology in Business. She chose psychology as she wishes to work with vulnerable people and help them overcome their problems. Ashley says that she is very happy with the way her life has taken its course. She disclosed that growing up in the Tierra Vida community has been a blessing. She describes the community as a place that supports each other irrespective of culture, background or race and a place where children and youth enjoy immense support and guidance so that they can flourish in their lives. Ashley’s life is a wonderful example of how a supportive and helpful community can influence a child’s life for the better. The love and support that she received from her community has helped her overcome many other challenges in her life and gave her the courage to dream big and chase that dream. And while Ashley continues to chase her dream, the Center for Sharing and the Tierra Vida community wish her the best for the future and pray that her dreams come true.